“I've updated and moved around my website - it's now at www.craghead.com. The old wcraghead.com will still host my blog and will point to the new site. I've added a couple new things: links, bio, press, plus more sample pages of books and a new blog of my postcard drawings postcards AHOY. Warren is a great guy and I really love his work. Peaceful, contemplative lines converge on the page in a way that immediately relaxes you. Be sure to check out his postcard blog as well. 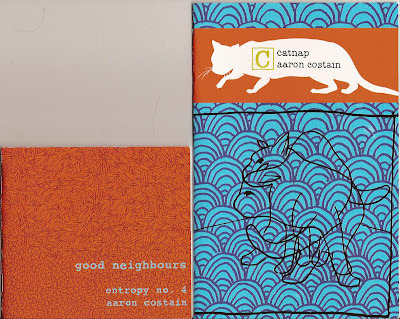 Both issues three and four of Aaron Costain's Entropy are cat-centric. Issue three is a silent cat story that begins with a cat waking from a nap in the forest and ends with the same cat curling up on a comfy living room couch. 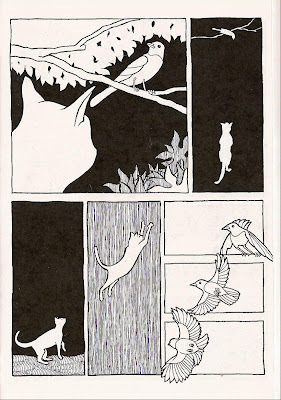 In between, the cat stalks birds, stretches its legs over short graceful sprints, and stumbles upon another cat. Aaron's art is very precise. The lines forming shapes and figures are very bold and deliberate. Although he uses organic shapes like leaves and bushes, he also generously uses non-organic patterns to fill in backgrounds. In one three page sequence, he moves simple black ink backdrops to tightly grouped vertical lines to four different types of foliage and then finally to tightly grouped horizontal lines. This lends the panels a feeling of movement. The reader's eyes quickly follow the cat's lithe body through these changing backgrounds. Issue four of Entropy is less focused on art and backgrounds, but more focused on plot. Once again a cat takes center stage, but this time she interacts with an eagle and a wild boar. All three characters are mothers laden with growing broods. Crafty as any cat can be, this cat gains the confidence of both the mother eagle and mother sow. 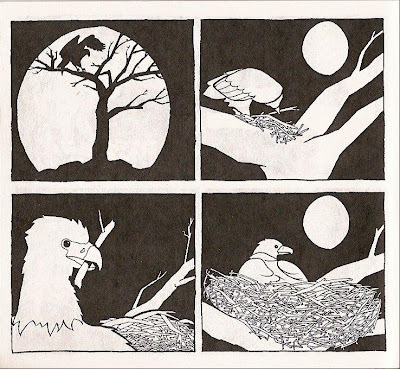 The cat slyly plants nefarious thoughts into both eagle and sow's minds, playing on their maternal instincts. This is a brutal story that leaves you cautiously eyeballing your own cats as they slink through your house. Both of these minis are a nice addition to the Entropy line of comics. Check out Aaron's website. 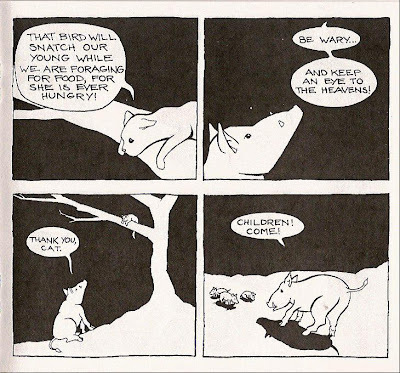 You can find his comics at The Beguiling, Quimby's, Chicago Comics, and Strange Adventures in Halifax. You can also contact Aaron directly at acostain@gmail.com. 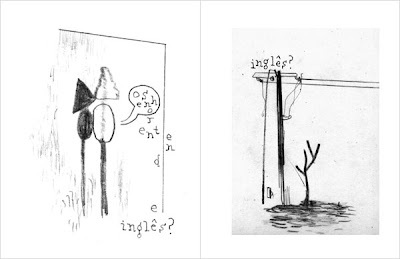 Entropy issue three is 8 pages for $3. Issue four is 24 pages for $4.